This paper takes forward the view put forward by Diana Gittins that the visual representation of childhood appeared simple but could have deceived Victorian audiences. It does this by analyzing those images - few in number - which linked childhood with death and describes them in relation to the majority of childhood imagery between 1870 and 1900. The paper also suggests that there are pitfalls in regarding the visual part of the historical record solely as an illustrative resource. The author argues that death did not belong in the Victorian cultural delineation of the child's world. Rather, mortality is best understood as one part of the adult domain in which the child was a relative stranger. When childhood was brought into close visual alignment with death, notions of remorse, reproof, sin and safety could emerge alongside grief as preoccupations which concealed as much as they revealed. The known reality of death's impact on children's lives was kept visually hidden from Victorian audiences, even if it was acknowledged in many associated commentaries. The vast majority of images addressing childhood themes from the period set out a benign, if instructional, view of relationships between adults and children. Those few images which did link childhood with death were part of a social and cultural context which preferred to blot out their implications. Children were far more likely to be depicted as the embodiment of life. A preference existed for visual material which endorsed, rather than undermined, adult care and control of the child's world. Pictures linking mortality to childhood were few in number because they were unbearable to audiences for unacknowledged reasons. As well as grief, such scenes of mortality made graphic reference to occasions when adults were powerless to protect every child. This paper originated in a discussion last year with an editorial board member of Sociological Research Online about some startling visual images linking the child with death uncovered during my research into the picturing of Victorian childhood. Poignantly, the paper's beginning coincided with the desperately sad repetition on television newscasts of one picture of Holly Wells and Jessica Chapman in their matching red football tops, smiling for the camera. I began to ask myself about the relationship between this image and its public place in a narrative dominated by death. More recently, and ten years after the death of James Bulger, the video still of his departure from the shopping mall with his child abductors still carries enormous power with audiences based, I would argue, upon its context for the viewer rather than its content. Neither of these images is inherently unpleasant to look at, but the nature of the context in which they appear makes their reception almost unbearable for informed audiences. It seemed to me that the pictures of the past - in their distance from the distress and unease of the present - might offer the opportunity for a less turbulent, reflective appraisal of the conjunction between two themes that appear uneasily aligned, namely childhood and death. Working with images in their historical context carries its particular difficulties. These could be summarised as the potential of the visual image for dissemblance, to be both more and less than it seems. I take note of the warning that even '... scenes that seem self-evidently useful for social historians ... may show more than meets the eye'. In applying the skills and approaches of an art historian to the history of childhood, I am also very aware of how the visual representation of a group can contribute to attitudes towards that group in society in negative as well as positive ways. I have particular concerns about those images which don't readily fit or reflect discourse - both historical and sociological - and how their significance, if any, can be evaluated. In response to these methodological obstacles, my approach has two aspects. The context I use is essentially pictorial, so that images linking childhood and death are discussed in terms of their overall place in Victorian pictured childhood. This means that pictures from many different sources can be evaluated for their similarities and differences. This is particularly important in relation to images addressing the dual themes of this paper, since they occupy a very small numerical niche. By contrast, their meanings are held in common with pictured childhood on gallery walls, as well as newspapers, magazines, journals, lantern slides, and books. This makes it possible for me to comment on their capacity for representation in a way that is not easily accessible to other disciplines. For my method to be both comprehensive and coherent, the period chosen is relatively short therefore, concentrating on three decades in children's history from the beginning of mass education and significant milestones in the child rescue movement. It ends with a time when children had largely moved from the public zone of work to those of school and the home, an emotional journey for adults stimulated by what has been described as by Viviana Zelizer as the change in the child's status within the family from economic usefulness to a precious dependency. Of particular relevance to the subject matter of this paper is the description by John Gillis of this period as one during which a greater distance developed between childhood and mourning, part of a process which detached the living from the dying. What can images of childhood and mortality tell us about attitudes which came to separate death from life? In her insightful and powerful book The child in question, Diana Gittins devotes an entire chapter to the representation of children in visual art and in family photography. To condense her arguments enormously, she describes how the picturing of nineteenth century childhood led to the kind of representation characterised by a deceptive simplicity which concealed more than it revealed, to a myth of what children meant to adults which obscured the reality of Victorian adult/child relationships. Gittins argues that '...to really understand what the child means ... it becomes essential to consider how and why contradictions, complexities and paradox have been denied and disguised'. This paper concentrates on how this occurred visually, approaching the same issues of concern to Gittins, while working from a detailed knowledge of pictured Victorian childhood. Gittins describes her approach as interdisciplinary, which I have taken as an invitation to offer some explanation of how many of her conclusions are substantiated by the visual part of the historical record. Using this perspective, my paper will consider what contradictions, complexities and paradoxes arose out of the picturing of Victorian childhood in relation to death. Is Gittins right about the deceptive simplicity of depicted childhood when it included portrayals of mortality? Do these images appear to subvert or reinforce the myth - as opposed to the reality - of childhood? Do these pictures obscure or confirm power relationships between adults and children? Do the conclusions I reach as an art historian about their meaning differ from those reached by readers of this article? Finally, if there is divergence, does this mean that visual analysis of the historical record has something new to offer sociological research into childhood? Amongst the hundreds - if not thousands - of visual images representing Victorian children and childhood, the subject of death probably fails to achieve triple figures. This paper attempts to look beyond the more immediate reasons for this cultural phenomenon - that most spectators would find such images distressing and shocking - to reveal some of the complexities in the dual discourse of Victorian childhood and mortality. It will suggest that these subjects were rarely pictured together because death did not belong in the cultural delineation of the child's world at the time. This paper is important because it shows how the picturing of Victorian childhood in relation to bereavement amounted to more than the visual articulation of grief. Overwhelming and understandable as this emotion was, when the theme of mortality was brought into close visual alignment with childhood, notions of remorse, reproof, redemption, sin and saintliness, power and powerlessness emerged alongside it. Although I will discuss a number of fine art images - those regarded by art historians as privileged in the amount of critical attention they have received - the majority reached their audiences through routes that have suffered from scholarly neglect by comparison. Many are from temperance journals, some from the child rescue movement, others from the pictorial press. This paper is concerned with the important things that can be learnt from the visual part of the historical record on two aspects of everyday life - childhood and death - which rarely occupied the same pictorial stage. I will begin by discussing the rarest of these - images which depicted the dead or dying child. My second section will deal with the various indirect ways in which this almost unbearable subject matter was represented, which can best be described as images about - rather than of - child death. In doing so, I will also describe how the visual representation of childhood addressed the interrelated notions of heaven, safety and death. I will conclude by looking at how the pictured child figured in depictions of adult mortality and how this was understood in related commentaries. The image captioned "Lifting up the little form, he pressed it to his heart"
appeared in The British Workman in 1892. Close to the edge of a river or lake, a horrified man clutches the inert body of a little girl, surrounded by four stunned adults and an older boy in a smock. That this is a depiction of death is confirmed, to a lesser extent, by the lowered hat of the old man and the old woman's pinafore approaching her eyes; but most of all, the spectator's eye cannot avoid the hook and rope used to retrieve the child from the water. The child's body is positioned between the man's arms and the steel arms of the drag hook, between safety and disaster. That two of the men have not removed their hats indicate this is the moment after her retrieval, almost before the horror has sunk in. 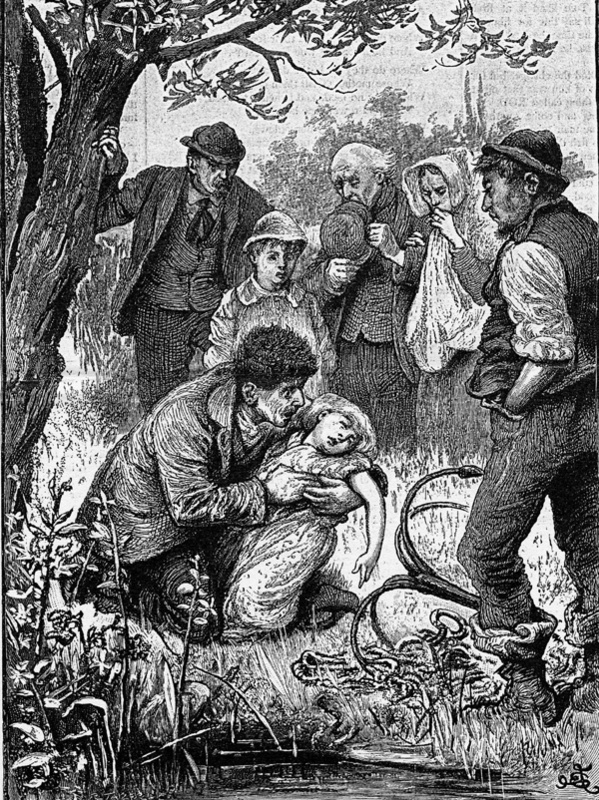 I know of no other Victorian image quite as explicit as this one in its efforts to convey the actuality of a child recently dead. This was achieved without the depiction of injury to the victim, without facial contortion, and with little disturbance to the child's hair or clothing. These omissions are entirely typical of Victorian pictured childhood, even where evidence of violence, neglect and abuse might be expected by modern viewers. The image just described accompanied a story about how a father's drunkenness meant he was incapable of preventing his daughter's death by drowning. At this point, the textual narrative gives few further details about the scene depicted, and never actually refers to the child as dead. 'The child was found', it states, '[h]er eyes were closed, and the cruel river had washed all the pretty colour from her face.' As a description of death by drowning, it is muted, contained. The father goes mad with grief and dies. Before he does so, he lingers outside the village pub, confronting drinkers with a word picture of his daughter's death. With his words, the narrative becomes dirge-like, repetitive in its reference to the water dripping off his daughter's body. 'Don't drink, don't drink; Nell doesn't like it. Poor little Nell, she's lying there so cold and wet - drip! drip! drip!' While the image emphasised the emotional, rather than the graphic, horror of child death, the text suggested an audience better equipped to cope with its actual ghastliness in words. The ghastliness of child death is expressed in words, separate from the shocked grief in the picture. The father in the story also acknowledges the influence of children at work in altering adult behaviour, a notion that is returned to again and again in temperance imagery. The sense that children could wield an active influence is not so easily found outside the movement. The capacity assigned to pictured childhood in other parts of the historical record to influence adults was counterbalanced by a preference for it to engage and entertain them. A number of pictures depict the burial, rather than the death of a child. One such is Frank Holl's painting called Her first born, Horsham Churchyard of 1877. In a rural churchyard, the gravestones are set well back from the village girls who carry the coffin on the left of the foreground and the grieving parents with their family on the right. The light tone of the coffin is echoed in the girl pall-bearer's dress and the mother's handkerchief. The family seem to walk in darkness towards the spectator, past the coffin's final resting place. 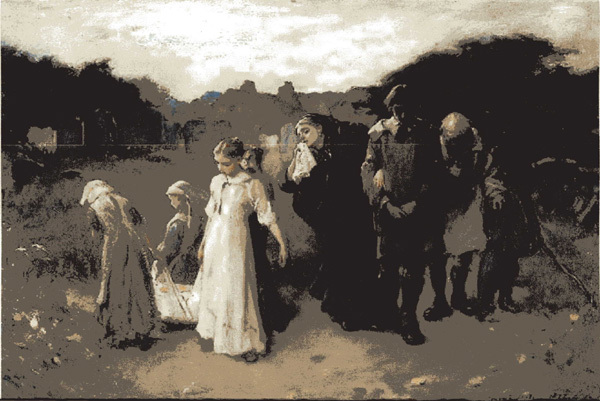 This image may depict what was known as a "walking funeral", a tradition of communal burial and mourning since the sixteen hundreds, which John Gillis describes as continuing into the twentieth century. If this is accepted, the young women carrying the coffin are contributing to the efforts of the whole community to support the family in its loss. This contrasts with the painting's title - with its emphasis on the grief of the mother - which seems to draw upon a more middle-class, individualistic cultural tradition. This painting is a representation of deeply-felt grief, without the emotional horror of 'Lifting up the little form'. Even without its title, the size of the coffin and the youth of the pall-bearers convey the theme of child death to the viewer. 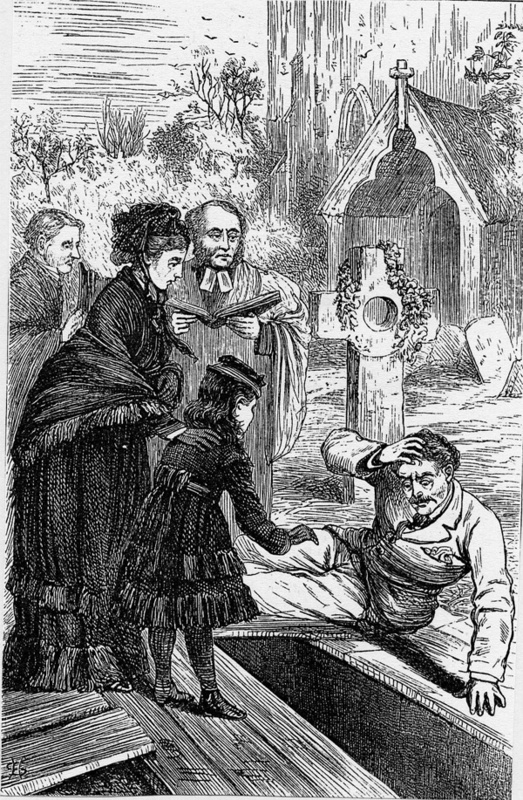 The tiny coffin featured again in an image captioned 'A dreary day' from The Illustrated London News of 1879. Although this images shares the lack of officiating clergy with Her first born, they are otherwise very different. 'A dreary day' does not represent a child's funeral. 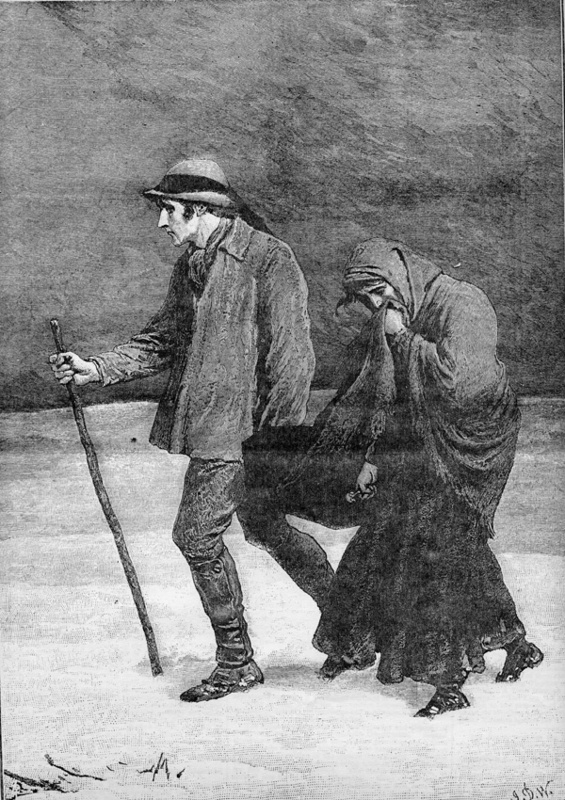 A man and a woman walk across an empty, snowy landscape, carrying a small coffin between them. The man grips a stick with his free hand and stares ahead. The woman holds her shawl up to her face, a response to either the cold or to the intensity of her emotions. 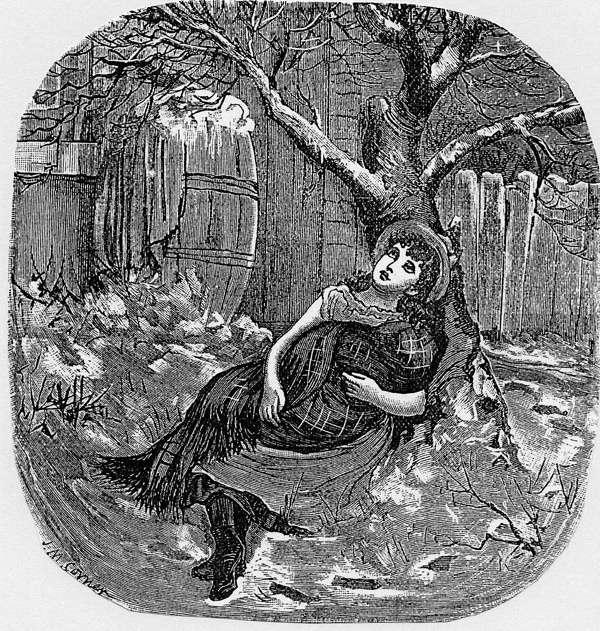 Cold, snowy weather often featured in scenes about mortality as well as childhood, and will be discussed later in this paper. The picture asks a question of its audience about the possible reason for the sad journey in inclement weather. In posing the question, the image suggests that something is not right, compared to the acceptance of grief in Her first born. This objection - perhaps indignation - is also hinted at in the caption given to the image. Such a reference to the lesser misery of inclement weather might seem inappropriate in the present day, given the tragedy of the picture's subject matter. In fact, The Illustrated London News used the engraving from a pre-existing painting to draw attention to the plight of bereaved parents seeking a place of burial for their children in isolated rural areas during times of famine or epidemic disease. The topic of the weather was a matter of great gravity in such a context. The newspaper drew together bereavement and harsh weather as a situation of multiple adversity. This is made clear in the following passage. 'It is indeed "a dreary day" for them, both externally, in the cold and gloomy weather under a darkening sky, and in the mournful occasion which has brought them from a home deprived of the innocent presence of their departed little child'. A sense is given here that the proper place for the child was believed to be in the home, and that this naturalness has been severed and disrupted by the death of the child. This division between outdoors and indoors was frequently made in the visual representation of Victorian childhood, although it was more common for the rural outdoors to be a wonderful playground for children. That it was not in this case would have further emphasised the aberration of untimely death. The portrayal of a harsh, intimidating urban environment frequently featured in the depiction of the child in danger, conveying the notion of unacceptable childhood to spectators. Something of this threatening quality of the urban outdoors is present in a temperance tract image from 1885, which has no caption, but accompanies a moral tale called "Locked out". This is a wintry garden scene, with some dissonant features in it. A girl with bare arms, boots and a hat sits propped against the trunk of a leafless tree. As if to emphasise the cold at work on her bare flesh, the child in her arms is entirely swaddled in what looks like a blanket, while the snow collects on the frozen water barrel. I know of only one other image from the child rescue movement which captures the same stillness of pose and seeming indifference to the cold. In both cases, the indifference comes from death. There were plenty of images depicting barefoot orphans in the snow, but these children usually engaged with the spectator or with adults within the picture frame, selling flowers, offering to sweep the crossing, or begging a few pennies. The tract story explains how parental neglect by a drunken father leads to the death of the child. In textual terms, the theme of "Locked out" is much the same as 'Lifting up her little form'. Even though the text leaves no room for doubt, the tract image leaves just a little scope for optimism in viewers that the girl is not yet dead and every hope that the wrapped child has survived. Compared to this possibility, the finality of 'Lifting up her little form' is incontrovertible. To summarise these very rare depictions of child death, as well as addressing the shock and grief of the bereaved, adult spectators and readers could be expected to evaluate the pictured death in a number of moral contexts. These included judgements about parental neglect, family breakdown due to intemperance, and a lack of institutional sensitivity towards, and support for, the bereaved. It can also be said that where child death - rather than burial was depicted - pictorial responsibility lay in the articulation of feeling in response to it, rather than the horrific realities of mortality. These realities would be suggested by portraying a hostile outdoor environment, rather than any damage to the child. This kept such representations within the boundaries of a cultural convention which also required the pictured child to amuse and appeal to adults. It was not necessary to picture a dead child to evoke the intensity of mourning which such an event might cause. The image known as 'The empty cradle' appeared more than once in the temperance literature of the period. A man and a woman are pictured in a domestic interior. The seated woman clasps her hands and lowers her eyes to the cradle below her. The bedding in the cradle is drawn back, rumpled, as if the child has only just been removed. The man stands behind the woman and the cradle. His attention might be on the lock of hair he holds in one hand. The hair is probably from the head of his child, now dead. This is all he has left of his child. It is the immobile intensity of the parents - their concentration upon the absence of the baby - which conveys the atmosphere of grief over a death. 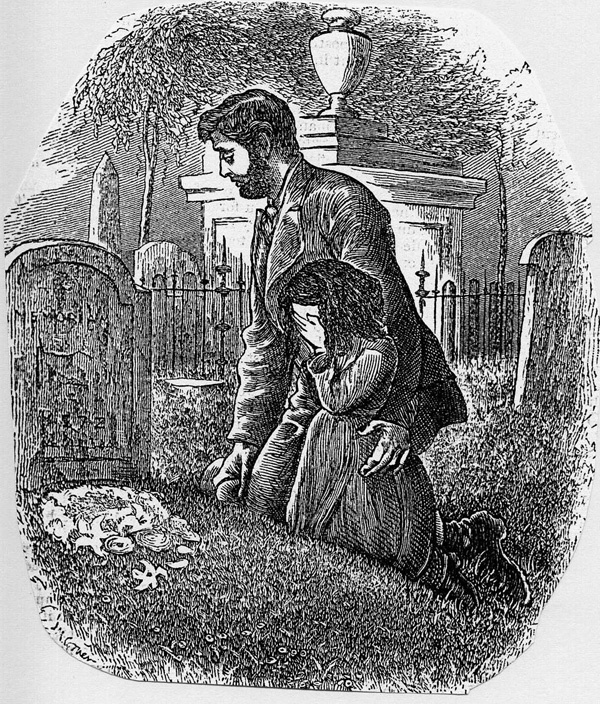 When this image first appeared in the Band of Hope Treasury in 1871, the writer of the accompanying text suggested to readers that it was just as appropriate for the parents to feel gratitude to providence as grief on the death of the infant. However startling this may now appear, the unknown writer must have had good reason to assume that readers would have agreed that the parents '... hardly dare to grieve, for the stainless, sinless child, who ... might have grown up with evil passions and wicked heart.' The suggestion here is that the parents should feel a measure of relief that in dying in infancy, their child lived in their memory forever without moral blemish. When 'The empty cradle' appeared in the magazine again in 1886, the harshness of this comfort was softened. An accompanying poem assumed the father's voice, which encouraged the mother to think of the child as safe in heaven. '"Safe is he and happy- / With the Lord shut in; / Would we have him suffer? / Would we have him sin?"'. This narrative positions the appeal of heaven as a place of safety and happiness for the child ahead of the fear that the child growing to adulthood risked becoming a sinner. The work of both John Gillis and Pat Jalland on Victorian attitudes towards death confirms that this view was not confined to supporters of temperance. The notion that children were forever sinless in heaven was offered as a comfort to, and by, parents in general whose child, or children had died. There is also the implication that Jesus was seen as assuming the parenting role, both by the writer of the poem and by the editors of the journal. The wish to protect was expressed through a religious framework of beliefs that demarcated the material world as dangerous, forever set apart from a paradise regarded as totally secure for the child. These attitudes emerged again and again in the literature of child rescue and of the temperance movement. One of the most dreadful aspects of child mortality for parents was that the only protection against contracting a life-threatening disease could be the child's isolation, both from parental protection and the company of the child's siblings. Such parents felt this separation keenly, and it was understandable that quarantine without the hope of recovery would encourage the handing over of protection to divine power. The counter-posing of safety and danger often featured in pictorial dramas of the period that indirectly addressed the subject of child death. In one case, this is achieved by contrasting a shadow world with the real one. 'Look at this picture' invites the editor of The Children's Advocate for 1872, under a front-page story titled 'Adoption'. 'See the woman and her little child in the cold street', he continues, 'dark but for the ... light that streams out on it, warm and pale from pleasant rooms ...'. Ostensibly, safety is pictured here as the warm, light indoors, danger as the cold, dark urban outdoors. 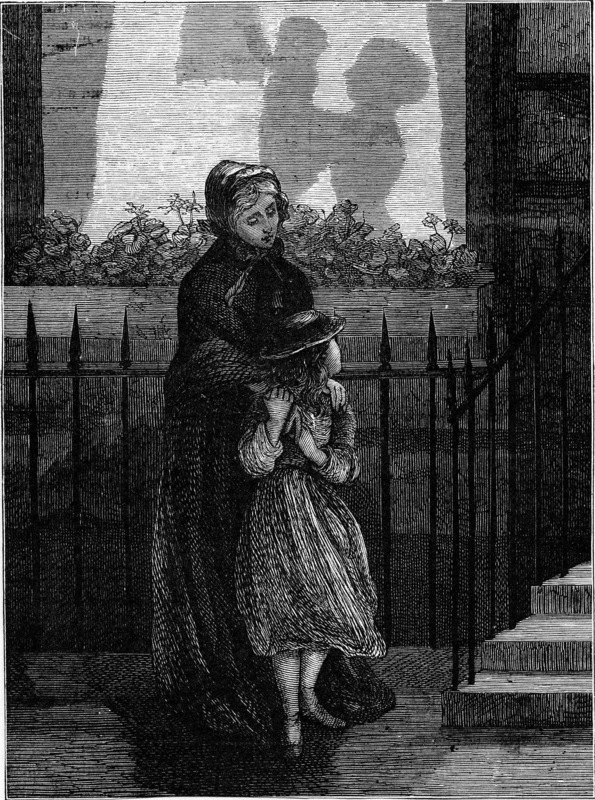 A cloaked young woman rests her hands on the shoulders of a girl, who turns her head to look through the lighted window behind them. Behind the blinds shading the window, a woman lifts up an infant in front of a tasselled lamp- shade. The spectator might have looked at the picture and wondered how it could be connected with the subject of adoption. Was one of the children's mothers about to die, and if so, which of the children will become adopted? The pictorial evidence - and the opening paragraphs of the narrative - strongly suggests death will come to the parent in the street. Light and warmth in the visual representation of childhood was habitually associated with safety. However, as we have seen from 'The empty cradle', Victorian audiences could be predisposed to see Heaven, as well as the well-appointed home, as secure for the child. The story of adoption unfolds to reveal that the baby pictured as safe in warmth and light, protected by his mother's arms, is about to die. 'For near as death is to her [the mother in the street], he is coming more quickly still to that bright home behind her - and the baby boy of whom his mother is so fond and so proud, will be with the angels then.' The horror of the textual narrative is contained pictorially by converting the place of material safety to a world of shadows, by taking out the tones, lines and features, even the density of a silhouette, from the scene indoors. Gentle and understated thought it is, this interior is a scene of imminent child death. Where the picture accompanying the 'Adoption' story left open the possibility of death for the adult rather than the child, the image captioned 'What the train brought' strongly implied that the death of the children's father was to be expected. Indeed, this image from The British Workman for 1885 carried a sub-caption "Stop! Stop! Or you'll kill my daddy". In the foreground, a man lies across a railway line. Behind him, one child screams and hides her eyes from the approaching train with a futile, warding-off gesture. Another child, also a girl, runs away from the man on the tracks towards the train. An undifferentiated spectator - one who had never read the journal before - would be likely to conclude that although the child was in some danger, she was not as close to death as her father. He is obviously too heavy for the girls to move, perhaps he is dead already. The readers of The British Workman were accustomed to pictures full of moral import, many of them addressing the destructive impact of intemperance on family life. It is just possible that, given this attitudinal context, viewers might have anticipated that what the train brought was death to the child rather than to the adult. The text accompanying the image explains that the girl's father is drunk, and, in her successful attempt to save him, she is killed. In a further heightening of pathos, the story reveals that the girl was originally abandoned then adopted, and brought to her adoptive father on a train. Under cover of this admittedly over-worked appeal to readers' emotions, the subject of a child's violent death has been addressed. The destructive social sequence favoured in the temperance world picture tended to depict the victimisation of the adult by drink, which led to the suffering of the child as the result of family breakdown. 'What the train brought' was very unusual in hiding its subject matter in pictorial detail, something I have seen repeated only once in the imagery of the period. These rare images actually deal with a narrative of children dying needlessly as a consequence of adult behaviour, though they do not picture this reality directly. To summarise these indirect pictorial references to child death, they rehearse fears about apparent and actual child safety. The absolute safety of the child in Heaven could be offered as a form of comfort to the bereaved as they coped with the child's irretrievable absence from the home. In another case, the apparent security of the comfortable, warm, well-lit home could be no more than a shadowy illusion. Or the child could be pictured putting herself or himself at mortal risk in response to adult indulgence. Pictures that dealt with the death of a child - whether direct or indirect - represented an acknowledgement of helplessness and frustration that arose from the knowledge that every child would not survive to adulthood, and the powerlessness of adults to protect all children in earthly life. I now turn to whether these preoccupations also emerge from those images which connected childhood with scenes of death in adulthood. The first three images to be discussed in this section return us to the graveside. 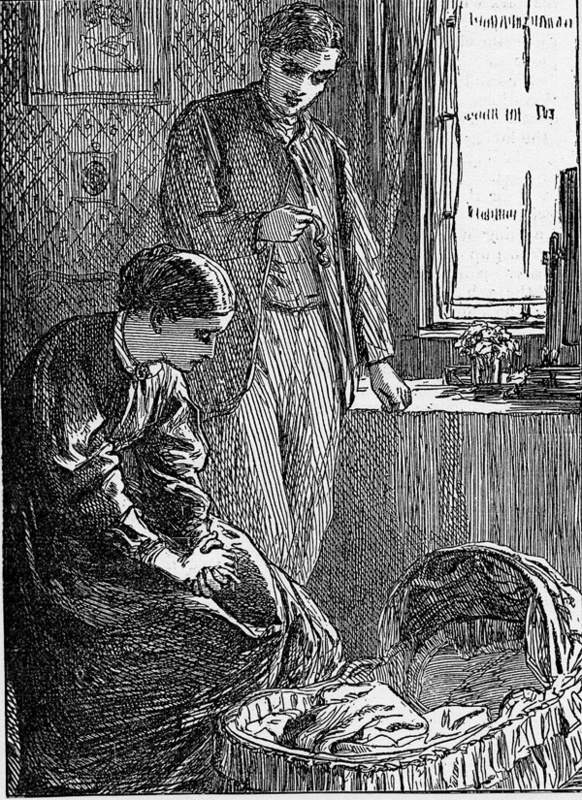 Indeed, the picture accompanying the 1879 tract tale called 'A faithful witness' seems to share the quiet grief of 'Her first born'. This tract drawing depicts a man and girl kneeling beside a grave that has grass growing on it. This would suggest that the dead person they grieve for died some time before. This adds an enduring component to their grief, perhaps even - in present day terms - its lack of closure. The use of an image at the start of a temperance document conveyed an intended meaning to its audience that the pictured death - as well as causing great sadness - was avoidable, regrettable, and related to alcohol in some way. This is hinted at in the information immediately below the tract's title, beneath the image. This told readers that 'A faithful witness' was written by the author of "The Wife's Remorse" and "Lost for Pride". In this way, grief was associated with different moral strictures. For this audience, therefore, a predisposition would have existed to interpret pictures of death in terms of moral decisions and choices in life. The girl in 'A faithful witness' covers her face, perhaps she weeps. The pictorial presence of children could make the impact of depicting adult death more intense. Children were far more frequently pictured as responsive to, rather than complicit in, alcohol abuse. This particular image is unusual because it was intended to be understood as a picture of redemption for adult and child. Both were warned by the dead scripture-reader - at whose grave they mourn - that for the child to collect the adult's jug of beer from the pub - was wrong and dangerous. The child has been drawn in to the adult's alcohol abuse and risks her own future happiness. The tract writer wanted readers to understand that both mourners were pictured '... vowing henceforth to live to God and not to themselves, both arising from that grave - life abstainers'. (My emphasis) What the tract writer ignored was that children like the girl in the story of 'A faithful witness' were asked, or told, to collect jugs of beer by adults. To have refused to do so would have involved disobedience to their parents, which was the first step on the road to ruin in the temperance world picture. Despite this partiality for injunctions which suited only one argument, temperance was very much like the rest of society in its emphasis on the obedience of the child to the parent. In reality, it was doubted that children liked the taste of beer, although they were believed to enjoy the light and warmth of pubs. The temperance movement occasionally made use of pictures of child topers, but portrayals of a boy or girl mourning alone were conspicuous by their absence. Although there were hundreds of depictions of orphan children, including the solitary child at risk, in the Victorian cultural picture, I do not know of a single image that portrayed a child alone beside a grave, whether open or closed. This may have been due to a perception that adult death was - or should be - removed from, the child's world. This meant that death was seen as occurring in the adult domain, to which the pictured child was a relative stranger. If this is accepted, then it is also fair to assume that the pictured child at a scene of adult death could be comforting, since she/he reminded spectators of continuing life, and of a child's world which was set apart and safe from the predations of mortality. The theme of comfort will be returned to later in this paper. The pictured child usually brought to images of mortality the sense that the decisions and choices made in life - often but not always by the deceased - damaged the family. 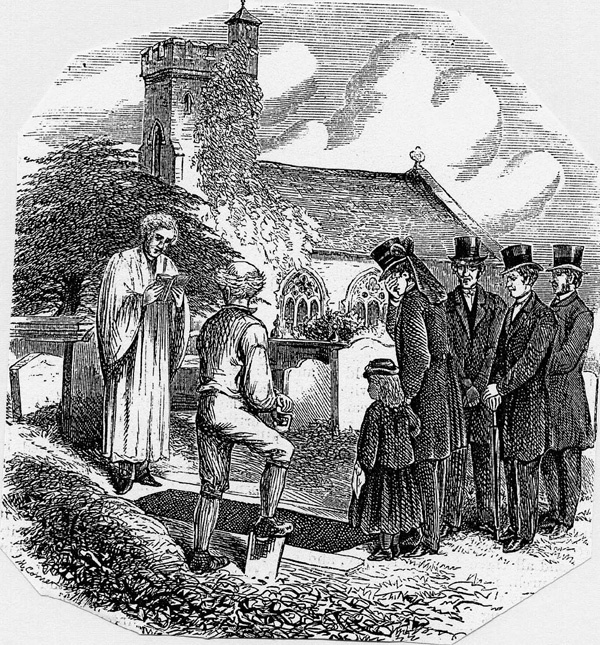 In two further graveyard scenes, (9 & 10), the child is pictured amongst the mourners, looking down into the open grave. Although it may be a coincidence in the historical record, these children are also female. The first of these scenes is again relatively tranquil. In the case of the second graveyard scene from 1875, the child witnesses a deranged adult response to death. The caption beneath this image tells readers how 'with a wild cry he flung himself down on the margin and looked in at her coffin'. Even without this textual guidance, it is obvious from the picture that the man was not dressed for a funeral and, by his uncontrolled behaviour, had not expected the death in question. He is brother to the woman, and the burial service is for their mother. The girl does not recoil from him, rather she appears to reach out towards him. Her gesture seems reminiscent of the woman's arm on her shoulder. Indeed, such pictured gestures habitually conveyed to Victorian audiences the comfort an adult would offer to a distressed child. However, the gesture could convey different meanings depending on the age of the person making it. With the exception of the solace felt by a grandparent in the presence of a grandchild, scenes which depicted the child comforter were rare. The inconclusive nature of the girl's gesture to the man in 'With a wild cry' maintained the boundaries of pictorial convention. By contrast, the tract narrative made clear that the girl's role at the funeral was to offer emotional support to the woman, and the child's emotions were left undisclosed. She is '... little Jane, who had helped nurse her [the woman's] mother, and whose hand was just a something to hold by on the margin of the grave.' (My emphasis) In order to support a story about a woman abandoned by a profligate brother, the child is converted into an animated prop, her feelings, apparently, irrelevant. This discursive contrast between image and text on the nature of adult-child relationships was highly representative for the period. So far, I have argued that the visual part of the historical record suggests that the Victorians pictured adult mortality as happening outside the child's world and that death occurred in the adult domain, to which the child was a relative stranger. The child depicted at the scene of death could be a comfort, but the child's role as comforter was confined to the text, to remain consistent with existing cultural convention. For temperance audiences in particular, pictures of mortality could be interpreted in terms of moral decisions and choices in life. The role of the pictured child in scenes of adult mortality was, in part, to introduce a sense of tragedy, or of danger to the family. I will close this paper with a discussion of one final image which encapsulates many of my arguments about the picturing of Victorian childhood in relation to death. Further, it will show how mortality and morality could be woven together in a didactic narrative intended to benefit the child. I have argued that when the themes of childhood and death shared a picture frame, such images could be used to engage with attitudes and feelings not necessarily associated with grief. I have suggested that this may have been because death did not belong in the Victorian cultural delineation of the child's world. The uses to which the pictured child was put suggest an impulse to create a place of safety for the child, at home or in heaven. What 'A picture and its lesson' does is to show how the desire to instruct could run alongside the impulse to protect. This image is separated horizontally into two halves and surrounded with a black border. In the top segment, a roman arch reveals a woman with a child in her lap. On either side of the archway, two biblical quotes draw out the relationship between ill-advised action and retribution, and between sin and death. These themes provide an emphatic context to the woman and child, one which converts what might otherwise be a nursing scene to a pieta, usually depicting the Mother of God with her dead son. In a Christian society, it would have been well understood that neither the suffering, dead child, nor the woman, had committed any sin or crime. 'A picture and its lesson', though a secular image, drew from a religious cultural tradition, and the mother and child have been given an everyday, rather than a holy, appearance. In the lower segment of the image, a boy sits at his mother's knee with a picture book. He and his mother are in conversation, while behind them, two young children seem preoccupied with their studies. Another young woman - possibly a governess or grown-up daughter - seems equally absorbed in the conversation between mother and son. Altogether, this is a scene of learning in a comfortable home. 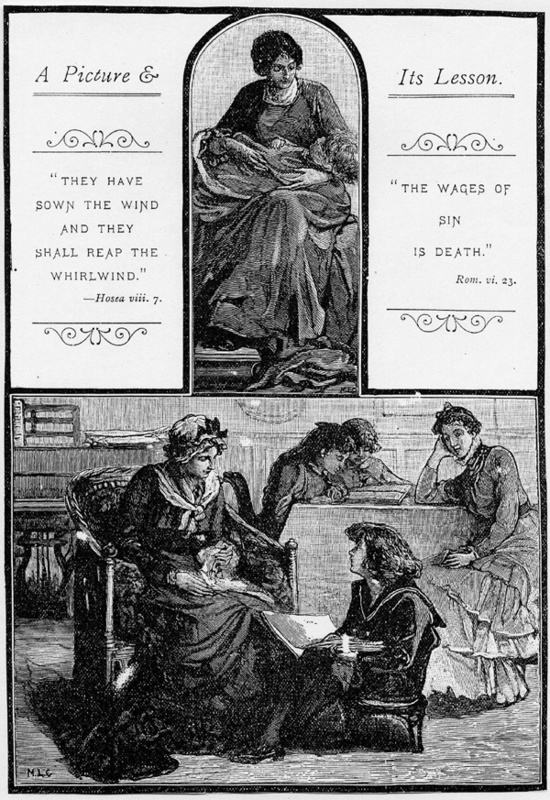 This 1890 temperance image combined twin scenes of death and edification for a juvenile audience. The accompanying text explains that the mother is telling a salutary tale of a drunken father striking his nursing wife and fatally injuring his child in response to the boy's sadness over a picture in his book. The nature of the picture in the boy's book remains undisclosed, suggesting that his empathetic response was of less importance to the users of this image than the opportunity to warn and instruct assigned to his mother. It can be of little surprise - given the images already discussed in this paper - that the temperance narrative concluded that '...drink had slain child and father and robbed the mother of all that life can give.' What is perhaps more surprising to the modern reader is that, following her child's death at the hands of her husband, the story would have us believe that 'the broken hearted mother was left to mourn, not so much that baby was gone from her for ever, the agony to her soul was the cause of this trouble.' (My emphasis). Hidden away in this heavy handed exhortation to be good and to avoid intemperance, is the notion that grief should be seen as secondary to anguish from another source. This story was extreme in its content, dealing with murder and suicide within the family, rather than grief. Combined, these themes provided an opportunity to instruct young readers on the very topics which were not perceived as belonging in the child's world. In this case, the bridge between the worlds of adulthood and childhood could be viewed as one of instruction. By doing what they were told, children could keep death where it belonged, in the world of adults. The vast majority of visual imagery in this period reinforced the myth of childhood as a discreet, distinct place of safety supervised by adults. Against this background, pictures linking children with adult death were as disruptive as those depicting death in childhood. They made uneasy reference to the limits surrounding the adult's ability to control the child's world; intervention inside it was possible, protecting it from all intrusion was not. Even though there are so few images which link death with Victorian childhood, considering them in the context of the thousands of images which featured children leads me to agree with Diana Gittins in her conclusion that they '...are invariably constructed by adults to convey messages and meanings to adults.' This amounts to more than a commentary on image origination, as it concerns the use to which these images were put and audience response. The very few examples of pictured child death deflected any reference to violence and abuse away from the child and into the child's environment. In the few cases where children were pictured at the graveside, it is surely significant that one child covers her face completely, while another two are pictured from behind, so that their faces are obscured. In pictorial terms, this suggests concealment, as if they do not belong, even if they are present. A state of death appears much the same as sleep, while heaven is suggested as the ultimate place of safety for the child. The capacity of the Victorian pictured child to appeal rather than horrify, to engage rather than shock, usually took precedent over the visual representation of reality. Conveying the reality of mortality was the responsibility of the text, so that readers were not spared, while spectators were. This was entirely consistent with cultural conventions that preferred pictures of children - whether rich or poor, diseased or healthy - not to refer too directly to any failure by adults to create a world for them which was entirely safe. The problem with the pictorial intersection of Victorian childhood and death was that as subject matter they co-existed uneasily, with adults preferring to think of children as representatives of life, living in a world that they could create, supervise and protect. Gillis writes that for the middle classes at the end of the nineteenth century, the child had become 'the favourite symbol of life'. It is easy to see how such a symbol could only have shared a picture frame with mortality with some difficulty. This dissonance was not confined to the nineteenth century. Gittins argues that few realise the extent to which the visual representation of children remains symbolic, particularly in relation to notions of futurity. If this is the case, adults continue to need pictured childhood to reassure themselves that they have a future. Perhaps the greatest paradox of all for the Victorians was that it was nearly impossible to represent the child as a symbol of life in death, even though, as Gillis puts it, 'by 1900 the death of a child had come to be grieved more intensely than the death of any adult'. The reality was that the death of a child caused most grief, a reality denied in the visual imagery of the period in order that its cultural conventions could be preserved. The pictures of the past which I have discussed are subject therefore to contradiction, complexity and paradox. The logic of separate notional worlds of childhood and adulthood tended to deny the reality of death in children's lives. In some cases, the picturing of death seems to have offered adults the opportunity to protect in the form of instruction, using the didactic as the bridge between worlds. Rarely, children were pictured as rescuers, only to die in narratives rehearsing the failure of adults to ensure their safety. If these arguments are accepted, it is possible to conclude that the picturing of Victorian childhood in relation to death involved the uneasy preservation of what Gittins has called a myth - or what I would describe as adult notions of what childhood should be like - alongside an obfuscation of death in children's lives. Distilled down from the above conclusions, the sociological points presented in this paper can be briefly summarised as follows. It has endorsed Diana Gittin's suggestion that pictured childhood had the capacity to conceal as well as to reveal. Pictures rehearsing adult care and control of the child's world were habitually displayed to Victorian audiences. Such images formed the vast majority of visual culture addressing childhood themes; so much for what was revealed. The reality of death and its effects on children were concealed pictorially for two reasons. The first confirms the argument put forward by John Gillis, that children came to epitomise life for the Victorians at the end of the nineteenth century, as they detached their notions of the living from the dying. This attitudinal separation of children and death was mirrored in a cultural preference for pictured childhood to appeal, charm and entertain while offering opportunities for instruction. Such portrayals tended to exclude the extreme expression of misery, despair, dislocation and loss. Socially and culturally, children were more likely to be visually represented as the embodiment of life. The second reason for concealment - and more difficult to unwrap - was that images linking mortality to the child were few in number because they represented occasions when adults were powerless to protect children. Up to now, this point has been implicit; I now turn to its explicit implications for future research. The picturing of Victorian childhood cloaked adult fears about the threat of mortality to the child's world in an aspirational construct of hopes that adults could ensure the safety of children. To this extent images were deceptively simple, hiding the worst that could happen to children behind the best, adult helplessness behind power. The purpose behind their use was to emphasise those areas where adults believed they could exert care and control over safety in childhood and divert adults away from their inability to guarantee this in practice. I would contend that this explains why the historical record contains so few visual images of death in relation to Victorian childhood. One purpose of pictured childhood was to hide the sense of powerlessness that came from a failure to protect children from harm at all times; it is entirely logical that this should be particularly apparent in the representation of the greatest threat of all. My introduction referred to the unbearable nature of the links between childhood and mortality, and argued that pictures addressing both themes amounted to more than straightforward illustrations of grief. Perhaps their most unbearable aspect for audiences was that death emphasised the helplessness of adults. Indeed, I would suggest that this painful reminder of adult powerlessness is at work in audience responses to those present day images of childhood mentioned in my background remarks at the beginning of this paper. Collectively we are unable to ensure the safety of every child and it is extremely uncomfortable to be reminded of it. Perhaps in our response to these images we even make contact, through this unease, with the powerlessness of children to control the notional world created for them by adults. Far from images of childhood illustrating relationships of power between adults and children, we must allow for the possibility that they represent our powerlessness where we would like to be most powerful, and that we continue to use them at times - as the Victorians did - to hide unbearable truths from ourselves. These are the conclusions that I have been able to reach by applying visual analysis to some aspects of sociological discourse on the subject of childhood. This paper will succeed if readers find its conclusions differ from their own; in short, if sociological research finds that the visual may have something new to contribute to how children are depicted in relation to how they are treated. My conclusions about the present can only be conjecture based on my knowledge of the pictorial past; much work remains to be undertaken as collaborative research between sociologists, historians, and specialists in visual culture. I would like to see this happen and to contribute to it. Until then, I hope that I have managed to demonstrate that pictures do not necessarily support the development of discourse around childhood safety and notions of power in the relationships between adults and children. 1 The Journal of Interdisciplinary History, volume xxxiii, number 1, summer 2002, p89. A review by Theodore K Rabb of Peter Burke, (2001), The historian and art : a new maturity, Ithaca Cornell University Press. 2 See Viviana Zelizer, (1985), Pricing the priceless child The changing social value of children, New York: Basic Books. 'This book focuses on one sociological dimension that has received little attention in the literature: the independent effect of cultural factors redefining the value of children in the US. '(p11) Zelizer refers here to her use of documents from the insurance industry in presenting the value of the child to adults. 3 See John R Gillis, (1997), A world of their own making a history of myth and ritual in family life, Oxford University Press, chapter 10, 'Haunting the dead', pp201-221. Gillis's book describes the largely modern, mostly Victorian origins of family life. His chapter on death argues that the traditional family reunion is more suited to the cemetery, with its emphasis on the eternal, with notions of the domesticated family in heaven, than fast-paced modern life. 4 Diana Gittins, (1998), The child in question, Macmillan Press Ltd, chapter 4, 'What do children represent?'. Gittins gives her own warning about the visual representation of childhood. 'We as watchers' she argues 'do not know the context in which images are constructed, we do not know their history and the net result of this is that their history is denied.' (p110). 6 The statistical picture for infant mortality varied little during the period. The death rate for infants under one year old in England and Wales was exactly the same in 1840 as it was in 1900 and varied little in between. It hovered around 154 per 1,000 live births. 7 The British Workman, (1892), p48. 8 The British Workman, (1892), p48. 9 See John R Gillis, op. cit., pp201-221. 10 The Illustrated London News, (1879) April 26, p386. 11 Rather than contribute to the well-known debate about why and if parents mourned more or less for their children in periods of high infant mortality, I have confined myself to the evidence of contemporaneous commentaries accompanying the visual part of the historical record wherever possible. For a concise summary of the debate see Pat Jalland, (1996), Death in the Victorian family, Oxford University Press, p121. Jalland argues that her findings support the position of Linda Pollock rather than Lawrence Stone. Jalland's chapter 6, "That Little Company of Angels": The Tragedies of Children's Deaths', pp119-142, provides a sound summary of family responses to child death. 12 The Band of Hope Treasury was the magazine of the juvenile temperance movement in the north of England. Bands of Hope were first created in the 1850s to draw in children to life-long habits of temperance thinking. Perhaps more important to campaigners than the child's pledge never to drink alcohol, was the hope that parents and other adults in their family circle would be influenced by children's purity and rectitude. 13 The Band of Hope Treasury, No 23, (1871) November, p102. 14 The Band of Hope Treasury, No 194, (1886) February, p17. 15 See Pat Jalland, op. cit., pp122-124. Jalland also describes how the 1879 publication of the memorial volume on the death of Archbishop Tait's children and his wife was one of the most widely read Victorian books of consolation literature. Tait became Archbishop of Canterbury in 1869; he and his wife wrote heartrending accounts of the deaths, one by one, of five out of their seven children. 16 My maternal grandmother had three sons, two of whom died in infancy. When her second son died in 1917, at the age of one year, one month after the death of her first son, a spiritualist neighbour from the other side of the street came to console her with the news that he was happy in heaven. My grandmother was distressed rather than consoled and my grandfather was furious with the neighbour. 17 For a full description of isolation as an attempt to protect and save the child from contagion see Jalland, op. cit., pp124-134. 18 The Children's Advocate, No 11, (1872) November, title page. The Children's Advocate was the journal of the National Children's Homes, part of the child rescue movement, and was edited by the Homes's founder, the Reverend T B Stephenson. 20 British Temperance League's Monthly Pictorial Tract No 165, (1879) July, p4. 21 The notion that children encapsulate the idea of the family is not a new one of course. This was very much the approach taken in the classic text by Philippe Aries, (1962) Centuries of Childhood, London: Jonathan Cape. 22 British Temperance League's Monthly Pictorial Tract No 44, (1869) June, p4. 23 Onward, (1875) June 1st, p106. Onward was the journal of the Lancashire and Cheshire Band of Hope Union and first appeared in 1865. 27 Gittins, op cit., p111. 28 These pictorial features were repeated elsewhere. A young girl is pictured from behind, so that it is impossible to gauge her expression, in 'Lord Frederick Cavendish lying in state at Chatsworth, 1882', an image which appeared in the Illustrated London News at the time. The girl is barely able to see into the coffin due to her height and its position. She shares this incapacity with the viewer of the image. Two other children, who are nearer the coffin than her, peer out between gentlemen removing their hats. A woman leans over the coffin to lift the linen covering the face of the corpse, to enable mourners to pay their respects. 29 Gillis, op cit., p210. 30 Gillis, op cit., p210. Every effort has been made to obtain the permissions required in the preparation of this paper. Any oversights are unintentional. Image (1) "Lifting up the little form, he pressed it to his heart", The British Workman, 1892, reproduced with kind permission of The University of Central Lancashire Library. Image (2) Her first born, Horsham Church Yard, Frank Holl, 1877, reproduced with kind permission from Sheffield Galleries and Museums Trust. Image (3) 'A dreary day', The Illustrated London News, 1879, reproduced with kind permission of The Illustrated London News Picture Library. Image (4) "Locked out", British Temperance League Monthly Pictorial Tract Number 236, June 1885, reproduced with kind permission of The University of Central Lancashire Library. Image (5) 'The empty cradle', Band of Hope Treasury, November 1871, reproduced with kind permission of The University of Central Lancashire Library. Image (6) 'Adoption', The Children's Advocate, November 1872, reproduced with kind permission of The University of Liverpool Library. 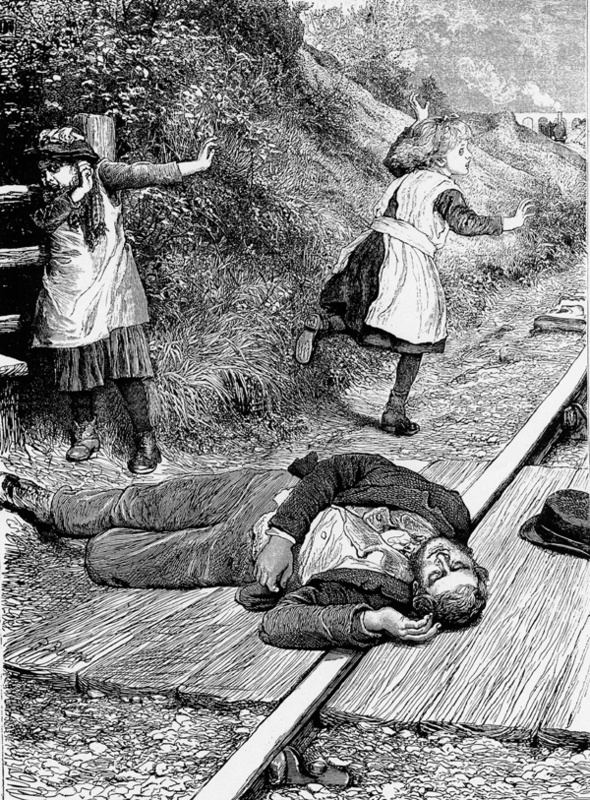 Image (7), 'What the train brought', The British Workman, 1885, reproduced with kind permission of The University of Central Lancashire Library. Image (8) 'A faithful witness', British Temperance League Monthly Pictorial Tract Number 165, July 1869, reproduced with kind permission of The University of Central Lancashire Library. Image (9) 'Oakhurst Rectory', British Temperance League Monthly Pictorial Tract Number 44, June 1869, reproduced with kind permission of The University of Central Lancashire Library. Image (10) 'With a with cry', Onward, June 1st, 1875, reproduced with kind permission of The University of Central Lancashire Library. Image (11) 'A picture and its lesson', Onward, 1890, reproduced with kind permission of University of Central Lancashire Library.